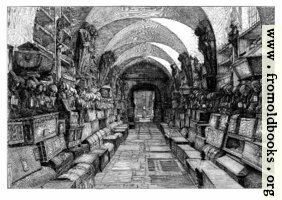 At the end of a long dark corridor, lined with coffins, chests, skulls, and the standing dead, we see an archway, and, through the arch, an old man, a monk, standing in a pool of light. 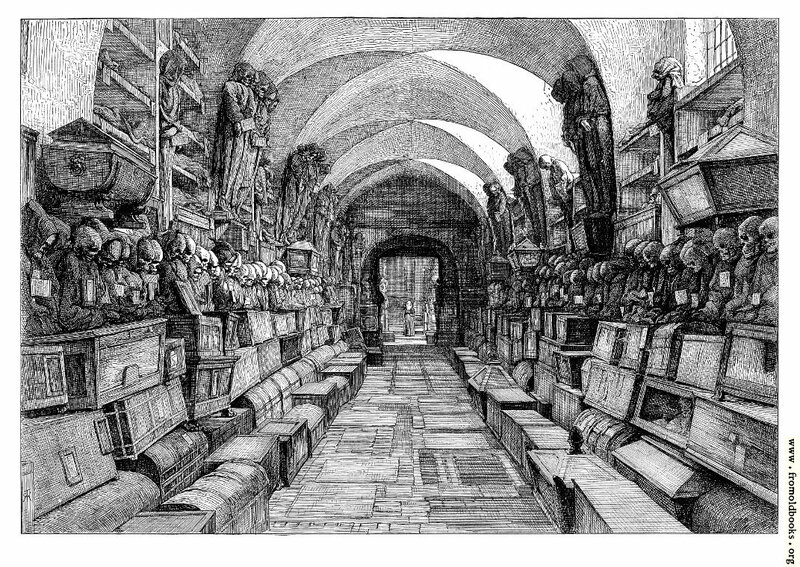 This is a very cinematic engraving, even though it predates cinema, and perhaps is a little dark even for Halloween. Near La Zisa [near Palermo in Italy] is the Monastery of Cappuccini (now [1870s] converted into barracks), in the Catacombs of which the rich people of Palermo deposit their dead. For some months the dead are placed in dry earth, perhaps mixed with lime; at the end of that time they are taken up, and dressed in the clothes which they wore during their lifetime, and are then either put in a wooden coffer and deposited in the Catacombs, or are placed in a standing position against the walls. The long corridors of the Catacombs are thickly lined with these miserable relics of mortality, which look down upon you from the upper walls, t o which they are fastened, in a horrible fashion. Each one bears in his hand a placard, setting forth his name, age, and date of death. Some hold in their hands a photograph of themselves, taken when they were full of life and health.